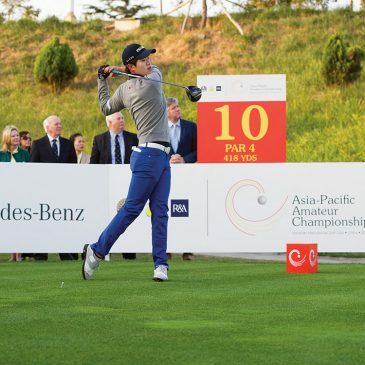 Lee Chang-woo claimed the fifth edition of the Asia-Pacific Amateur Championship by three strokes at the Nanshan International Golf Club in Shandong province, China. Lee became the second Korean to win the event after Han Chang-won won the inaugural event in 2009 at Mission Hills Golf Club in southern China. With the victory, Lee clinched a spot in the 2014 Masters Tournament, in addition to the Open Qualifying Series for The Open Championship, where he would be joined by runner-up Shohei Hasegawa of Japan. After posting earlier rounds of 70, 72 and 69, Lee started the final day with a slender one-shot advantage over Zecheng Dou. After mixing two birdies and two bogeys over the front nine to turn in a level-par 36, he pulled away from the competition with a superb display of ball-striking that produced birdies at the 12th and 15th. Although Lee played like a seasoned pro down the final stretch, he admitted to not being able to shed his nerves until his tee shot at the par-3 17th, which he struck to the heart of the green. Nanshan International Golf Club’s Garden Course is located in Longkou City in the northwest region of China’s Shandong province. The Garden Course is regarded as the most challenging of the six Nanshan International courses in Longkou City. No weather delays with cold conditions in the mornings. Lows around nine degrees Celsius and up to 25 mph winds in the first and second rounds gave way to a high temperature of 19 degrees Celsius on Sunday during the final round.